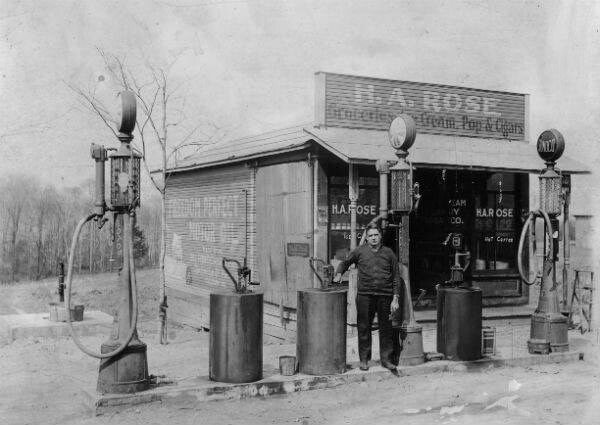 The first ever full service filling station was in 1913 in Pittsburgh. This eventually became a Gulf station which was a Pittsburgh Pennsylvania headquarters for decades to come. Now, remember there were not that many cars on the road in 1913. You might say I am wrong as the Model T and others were driving around. You are right except in 1913 lots of people walked, rode the trolley system or a horse. Imagine what those pumps would be worth today’s? Gadzooks it would be a fortune and those oil drums would be pricey too. I love that the guy is posing for the camera on such a lonely road in the fall. Note, no leaves on the trees. That road he is on is named Baum Blvd today and is a very busy road. I do not believe there is any marker of any sort but there should be if not. Full service meant filling up a small gas tank maybe, just maybe checking the oil and certainly adding or checking the water. I say maybe checking the oil because on a Model T one had to crawl underneath the car to do so. I am sure this guy was not a busy man throughout the day but his task was important. Obviously he is gone and the station is gone but we live to look at our automotive history. Why? It’s humbling. We jump in our cars today, turn the key or hit the button and speed away. Not so in those days. It was an event to take the car out and a lot of people went just to go. The roads were awful ( some things don’t change) and the cars were not exactly comfortable and warm on a brisk winter morn. But, we have come a long way since 1913 and I do wonder if this guy ever in his wildest dreams thought what it would be like in the year 2016.